Hand painted personalized gifts for every occasion. Custom art for your state of mind. The artwork I produce is very specific to your individual needs and is completely unique and one-of-a-kind. Pricing is based on the style and design of the project you want. After you've had a few minutes to view the variety of custom art highlighted thoughout this website I hope you'll be inspired to contact me so we can collaborate on your very own individualized work of art. Pet Memory Box - Remembering Zeke at the Colorado river. Pet Memory Box - Zeke with his best friend. Wood Wine Box - Hannah and Brian's wedding. Wood Wine Box - Personalized inside and out. Wine Glasses - A special gift for Kelsey and Tyler. Memory Box - A new baby celebration gift. Memory Box - A personal inscription inside. Memory Box - Makayla leaves Texas for college in Oregon. Personalized with her truck and two dogs. Wood Wine Box - A wedding in Las Vegas. Wood Wine Box - Personalized with a special message. Pet Memory Box - Best friends and part of the family. Pet Memory Box - Remembered forever. Memory Box - Under the sea Adventure Seeker! Wood Wine Box - Wedding Bliss for Karen and Mary Lynn. Wood Wine Box - Just Married and off to Hawaii. Eagle Scout Memory Box - A one of a kind gift for a new Eagle Scout. Basswood size 12"L x 9" W x 3"H.
Eagle Scout Memory Box - sized 12"L x 9"W x 3"H. This Basswood box celebrates Ryan's scouting life with a portrait of him. Eagle Scout Memory Box - sized 12"L x 9"W x 3"H. Hand painted with the Scout's favorite activities and a personal inscription inside the lid. Eagle Scout Memory Box - sized 12"L x 9"W x 3"H. This Basswood box celebrates a scouting legacy. Eagle Scout Memory Box - sized 12"L x 9"W x 3"H. Memories of Ian's favorite activities around the side with an inscription inside from Mom and Dad. Eagle Scout Memory Box - Basswood, sized 12"L x 9"W x 3"H. Ryan stands in front of his Eagle Scout project. Eagle Scout Memory Box - Basswood, sized 12"L x 9"W x 3"H. Ryan's favorite activities around the side with a personal inscription inside the lid. Boy Scout Memory Box - Super Hero! Boy Scout Memory Box - The twelve Scout Laws. Mache' Canvas - '1966 Batmobile' For the wall or a shelf. 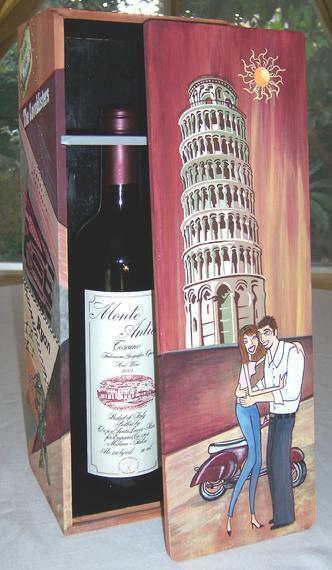 Wood Wine Box - The newlyweds in Italy for their honeymoon. Wood Wine Box - Memories of friends traveling together makes the perfect birthday present. Gift Box - For a scary movie lover. 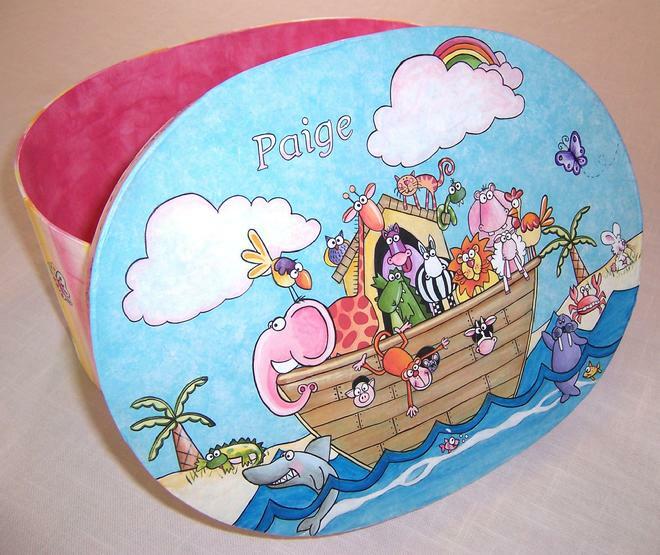 Memory Box -To brighten up a Noah's Ark-themed nursery. Memory Box - Bailey leaves for college and remembers all of her favorite things at home. Memory Box - Retirement from Child Time School with dreams of travel around the side. Canvas - 'Shoes Around The World' Six 8" x 8" canvas paintings. Gift Box - 'Ahoy Matey"
Shadow Box - 'Ready for Take Off' Hand painted inside with a knit hamburger rocket. Canvas - 18" x 24" Eggs and Bacon with a little skeleton. Canvas - 18" x 24" A burger and Fries with a touch of skeleton. Canvas - 18" x 24" Hot Dog with relish, mustard and a relaxing skeleton. Canvas - 18" x 24" A big piece of chocolate cake with a special decoration. Full payment is due upon placement of your order. After discussing your custom project, I will e-mail you a PayPal invoice. PayPal accepts payment by check, debit or credit card. When payment is received, I will begin working on your order so that it will be completed and delivered in time for your special occasion or event. Delaying your payment may also delay the completion of your order.